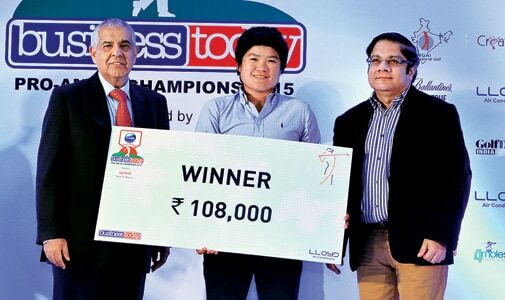 The two-day grand finale of the 19th edition of the Business Today-Lloyd Pro-Am of Champions teed off in style at the Classic Golf Resort in Gurgaon in early March. India's only Pro-Am, where top business leaders and women professionals play together, saw over 150 executives and 20 pros (10 Indian and 10 international) take to the course. "It was good to play today [day one]. The tournament provides the participants with an opportunity to do networking and find like-minded corporate decision-makers who can help in their business," said B.R. Punj, Chairman and Managing Director, Lloyd Electric & Engineering, and a participant. Participating in the event for the fourth time, Deepak Ansal, CMD, Ansal Housing, who played in Punj's group, was all praise for the picturesque golf course. "I like the course very much. It has a good layout. Though the greens were a bit tricky today, overall it played good." Agreed Rohit Jhawar of Usha Fabcast: "I have been playing in this event for the last four to five years and the venue couldn't have been better. We play with the pros and learn from them about golf discipline and on-course conduct." Sunil Wadhwa, CEO, Groupe SEB India, has been an integral part of the event. In fact, he hasn't missed a single edition since its inception in 1995. "I have sweet memories of this tournament as in 1997, I won a ticket to Scotland by winning [in a category]. One thing I find unique about this event is that we [get to] play with the pros. When you watch them play, you can pick up one or two shots which helps you game-wise also." "It's a two-day event and you never know who can come from behind and win. So, the excitement of winning is there till the last card on the second day is submitted," said Kavi Arora, MD and CEO, Religare Finvest. For Vani Kapoor, India's No.1 female golfer, the event was an opportunity to get in touch with corporates. "At times, it works in our favour as they end up sponsoring us." Back to the game, Thailand's Wichanee Meechai shot a round of three-under 69 to take the sole lead among the pros at the end of day one. She was a stroke ahead of the Indian duo of Saaniya Sharma and Smriti Mehra. Meechai's compatriot Pennapa Pulsawath was fourth at one-under 71. India's Gursimar Badwal and Thailand's Saraporn Chamchoi sharing the fifth spot with an even-par 72 each. On the final day, the Thai duo of Pulsawath and Meechai shot a 69 and 71, respectively, for a two-day aggregate score of four-under 140 each before fighting it out in a play-off. After setting up birdies on the first play-off hole, Pulsawath fired a birdie on the second one to clinch the title. Among the Indians, Mehra (73) and Badwal (71) were tied for third at one-under 143 each. "Last year, I lost in the play-off, so I am extremely happy to clinch the title this year. It was a tense play-off since we were squared on the first play-off hole, but Wichanee spoilt her tee shot on the second hole and I got it right to find a birdie and won the title," said Pulsawath. While Pulsawath walked away with the winner's cheque of Rs 1,08,000, runner-up Meechai got richer by Rs 76,800. Mehra and Badwal won Rs 57,000 each. Meanwhile, in the team event, Sanjeev Kumar, Sandeep Kumar, A. Keshavamurthy and pro Neha Tripathi emerged victorious with 111 points. Bhupender Berry, Ravi Khanna, Vivek Talwar and Thai pro Panuma Vitayakonkomol claimed the runners-up trophy with 109 points. Sanjeev Kumar (40 points) won the 19 to 24 Handicap category, Religare Finvest's Arora (42 points) emerged triumphant in the 11 to 18 group, while Mayank Arora (39 points) bagged the top prize in 0 to 10 category. Rohit Nath (340 yards) won the title for longest drive on day one, while Siddharth Sangwan (310 yards) came out on top on day two. For Sandeep Menon, Country Marketing Director, Google, who had played here earlier, it was good to be back again. "I got to meet a lot of people, and playing with pros was a different experience altogether." Kaushik Dutta, Founding Director, Thought Arbitrage Research Institute, also found the event different since it gives the corporate czars an opportunity to rub shoulders with the pros. "They [the pros] have a different approach towards the game and amateurs like us learn a lot from their game." This was also the fourth year at the event for Shubhodip Pal, Marketing Head, Yureka Mobile (Micromax). He said: "The female pros have the softest touch when it comes to playing shots, a good technique for the amateurs to follow." Didar Singh, Secretary General, FICCI, was also full of praise for the event and the golf course. "I played here for the second time. This is also one of the best golf courses in India. Playing with women pros teaches us that for golf, you don't need a big and sturdy physique. All you need is a good game to perform." Lloyd Electric & Engineering, India's eminent consumer durables company, was the principal sponsor of the event, which was powered by Raymond. Ballantine's was the beverage partner, 4moles.com the digital partner, NEO Sports the TV partner, Creatigies took care of marketing, and the media partners included Golf Digest and Mail Today.